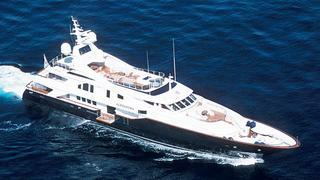 News comes from Burgess that they have a substantial price-cut on motor yacht Alexandra, down €2 million to €14,950,000. Alexandra is a 50m (163.9ft) Benetti, one of the ever-popular Golden Bay series, which features a Terence Disdale designed interior and a navy blue hull. With accommodation for 14 guests in seven cabins, the owner has maximised space on board by use of a clever arrangement, with an aft facing master suite on the bridge deck, allowing two VIP suites forward on the main deck and a further two double guest cabins and two twin cabins all of excellent proportions on the lower deck. Alexandra has a large sun deck equipped with a Jacuzzi, ample sun lounging space, fully shaded dining facilities and BBQ.